Oranges are one of the most popular fruits in Mexico. It may come as a surprise, but oranges are not a native fruit. The first oranges were brought on Columbus’ second voyage to the Americas. 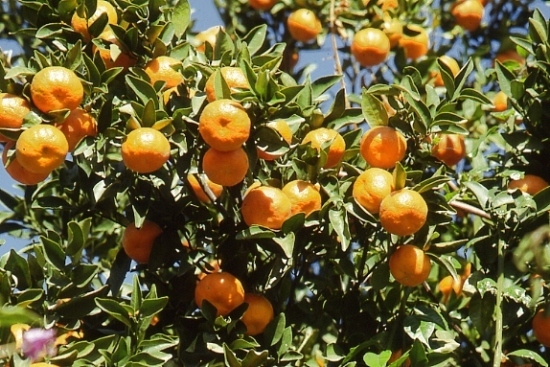 Early Spanish settlers began to cultivate orange trees almost as soon as they arrived. Aromatic orange blossoms have found numerous uses over the years, from being carried in wedding bouquets, to a cooking ingredient, to use in candies, teas and perfumes. Orange trees may not be a native plant, but they have certainly thrived in Mexico, which is now the world’s fourth largest producer of oranges. Mexico produces about 4.1 million tons of oranges each year; only Brazil, the USA and India produce more. Ornamental orange trees, commonly found in Mexico’s towns and cities, are usually bitter oranges. Veracruz is by far the leading state for growing oranges. It has 162,000 ha of orange orchards, and produces more than 2 million metric tons a year, about 51% of Mexico’s total production. 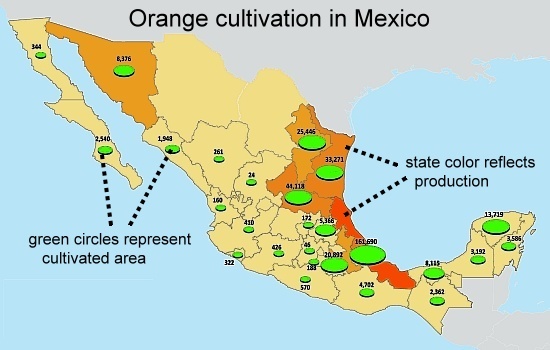 Other states where orange growing is important include Tamaulipas (13% of national production), San Luis Potosí (10%), Puebla (6.2%), Nuevo León (4.9%) and Sonora (4.1%). The area of cultivation for oranges (342,000 hectares nationwide) has remained virtually unchanged over the last decade. The average yield across Mexico for oranges is about 12 tons/hectare, though yields in some states, such as Sonora, are up to twice as high. Yields vary from one year to the next reflecting seasonal weather conditions. For those states where orange growing is an important rural occupation, the price paid in 2009 to the grower for oranges varied from 1.3 pesos/kg in Tamaulipas to 0.80 pesos/kg in Veracruz. Almost all production is for the domestic market. Consumption of oranges in Mexico averages about 38 kg/person/year. Improving methods of cultivation have increased yields, allowing Mexico to produce a small surplus for export. Exports have more than doubled since 2000. Almost all exports are either to the USA 74.5% or the UK (24.6%), with the small remainder going to other European countries and Japan. Export sales were worth 7.150 million dollars in 2009, equivalent to about 1% of the total value of the orange harvest in Mexico. Imports of oranges in 2009 were worth 3.400 million dollars; they have fallen significantly from the 9 million dollars registered in 2003. The values for imports and exports mean that Mexico has a small favorable balance of trade from oranges of around 3 million dollars a year.